I just love 'em built tall and handsome. Isn't this one of the most beautiful sights, ever? The BURJ DUBAI opens today in Dubai. Congratulations to all of the Dubai dudes who made this incredible accomplishment come true. At 2,600 ft. tall it is TWICE as tall as the former Sear's Tower in Chicago. "Dubai may be struggling financially, but money problems won't keep it from opening Burj Dubai on Jan. 4 and snagging the title for world's tallest building from Toronto, which has the soon-to-be second tallest CN Tower. Burj Dubai's actual height is a closely guarded secret, although developers admit that it will be at least 2,600 ft. (790 m) tall — almost twice the height of Chicago's Willis Tower [former Sear's Tower]. The tower, which cost an estimated $1.5 billion to construct, boasts 164 floors, nearly 1,100 one- to three-bedroom apartments and elevators that travel up to 25 miles per hour. Visitors to the 124th-floor observation deck can see 50 miles on a clear day." 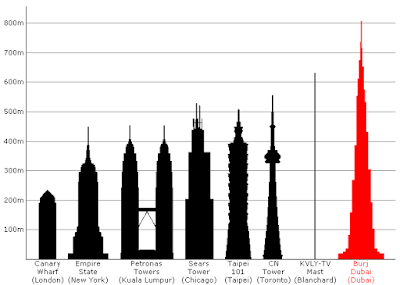 This photo is part of photograph series at TIME.com titled: A Brief History of World's Tallest Buildings. Tall buildings is one of my passions in life. 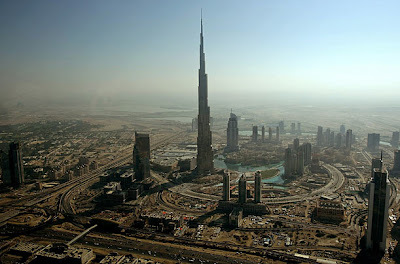 You can read other blog postings on Tall Buildings or Burj Dubai by clicking here. Keep driving mankind to newer heights and newer levels, Dubai. This is a most remarkable place. Read "A Brief History of Dubai." Abu Dhabi is full of many tall building but Burj Khalifa is one of tallest in the world.It is surprising buildings.I love this building.Its very nice and beautiful.Thanks for sharing pic of Burj Khalife.